Your wedding day is one of the happiest moments in your life. It’s a celebration of love and commitment with all of your closest friends and relatives. All eyes will be on you and your betrothed, and your mom will probably shed a tear. For a moment this monumental, it’s important to look your best. Not only for the abundance of commemorative photographs that will be taken throughout the day, but also for you and your fiancé’s own benefit. When it’s time to say your vows, you want to be your best self physically and mentally. 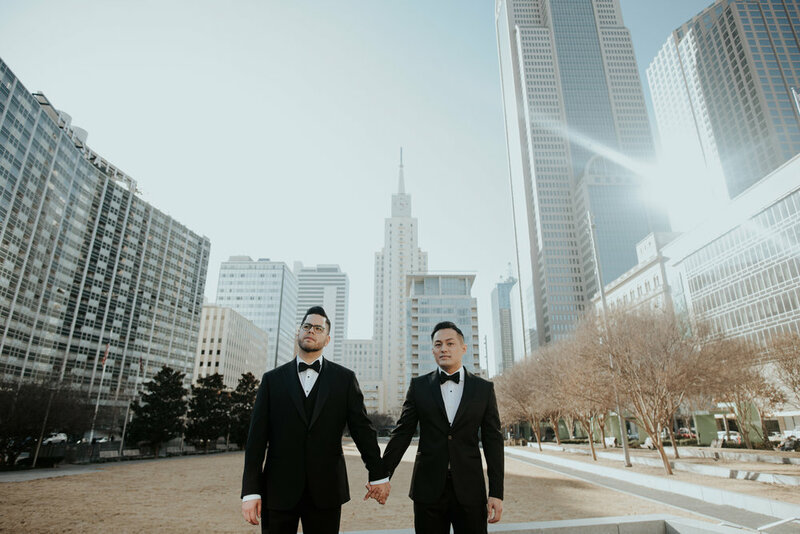 While there’s an abundance of tips and tricks for all of the respective brides out there, tips on how the grooms can look their best are relatively limited. So, here are some essential wedding prep tips for all of the guys needing some extra advice. Making sure your eyebrows are groomed, nails are clipped and tidy, and your teeth are pearly white may seem like small details, but together they make a difference in your final look and overall confidence. Plus, your fiancé will appreciate you going the extra mile to look your best on the big day. Schedule some time with an esthetician to get your eyebrows done, or do them at home with a tweezer and a mirror (and maybe the help of your significant other). For your nails, you could make it a date and go to a spa with your partner to get mani-pedis, massages and facials - or save money and do it all at home. To ensure your smile is picture perfect, you can take steps to whiten your teeth by switching out your toothpaste with one that has whitening properties or using whitening strips. While this could’ve fit into remembering the small grooming details, it takes special precedence because besides your hair and outfit, your skin is another major noticeable component of how you look. To avoid waking up the morning of your wedding with a massive pimple, make sure you’re practicing a regular skincare routine. This means washing your face with a gentle facial cleanser at least every night before you go to bed and moisturizing afterwards to avoid dry or flaky skin. If you have facial hair, how you trim and shave is also part of how you take care of your skin. Improper shaving habits can cause razor burn and unwanted breakouts. Make sure you’re using a fresh razor every 6-8 shaves, shaving with the grain of your facial hair, and taking steps to prevent bacteria build-up by storing your razor away from water exposure. Since your outfit is pretty much decided - traditionally a tuxedo with varying color schemes - your hair will be one of the main components making up your overall look. This makes it important to find the right style for the big day. If you’re looking to try something bold and new, make sure to consider how the style will complement your face shape. Get the new cut done at least a month before the wedding so that your hair has time to grow out in case the final look isn’t what you expected. Best advice, though, is to stick to the style that you already know looks sharp and schedule an appointment with your trusted stylist or barber at least a week prior to your nuptials. Your wedding day is always a good excuse to try to tone up or slim down. You’ll be able to fill out your tux in all the right places, and going to the gym can be a fun way to spend time with your significant other. Besides the physical benefits, though, exercising is shown to make you happier, help you manage stress, and even help you sleep better. Hitting your fitness goals is also a major confidence boost. The long-term health benefits of regular exercise make it not only an essential prior to your wedding day, but can improve your life well into your marriage.